Kawabata (f. by Encosta de Lago). 4 wins. See below. RIVA SAN (Any Given Sunday). 5 wins. See above. River Bypass. 4 wins from 1300m to 2050m, A$97,152, 2d MVRC Programmed Property Services H., MRC Deck the Halls H., 3d MRC Getting Deaf Kids Talking Cup, Goleen H.
Best River. Winner. See above. Marlon Lad. Winner at 1000m in Aust. Guns Ablaze. 6 wins-3 at 2-to 1100m, A$112,430, STC The Horizon at Mission Beach 2YO H., AJC Paul Keating 2YO H., QTC Oppressor H., 2d AJC Malaya 2YO H., BTC Courier Mail H., QTC Northside Honda H., Lord Rego H., STC Golden Wing H., 3d STC Tooheys New H., Qld Tatt's RC Mita Vite H., QTC Cockatoo Ridge H.
Guns for Silver - Harragon (Mac.). Winner at 900m, 3d STC PJ Gallagher's Parramatta H.
Firearm. 5 wins to 1400m in Aust. Caledonian Gold - Moon's Fairy (Sin.). 3 wins to 1200m in Aust. and Singapore, Singapore TC Class 4 H., 2d Singapore TC Class 3 H., Class 4 H., 3d Singapore TC Panasonic LED S., Class 4 H.
Best Fashion. Placed in Aust. World City. 2 wins at 1000m, 1200m, HKJC Carl F Bucherer H., Luk Wu H., 2d HKJC Kowloon Peak H., High Island H., 3d HKJC North Point H., Hau Wong H.
Khisdar. 2 wins at 1200m, 3d Waikato RC NZTI H.
Don Gallardo. 2 wins at 1800m, 1850m in NZ. Always Success. Winner at 1200m, 3d Singapore TC Class 5 H.
CINCINNATI GIRL, by Speculating. Winner at 1400m in Aust. Dam of 4 foals, 2 to race. Gypsy Ochre. 6 wins from 1200m to 1650m, BATC Kiwi H.
Kind Reply. 8 wins from 1000m to 1900m in Aust. Underland Lady. 6 wins to 1300m in Aust. Producer. Shamrock Sam. 2 wins at 1050m, 1450m in Aust. Gemfields. 6 wins-1 at 2-from 1000m to 1600m in Aust. Producer. Ali Pacha. 6 wins from 1300m to 1700m, 3d QTC Margate H.
Exerted. 4 wins at 1000m, 1200m in Aust. Gypsy Prophecy. 3 wins at 1000m in Aust. Short on Chips. 2 wins at 1200m in Aust. Soldier of War. 2 wins at 1600m, 1800m in 2015-16, GCTC XXXX Gold H.
Playmate. 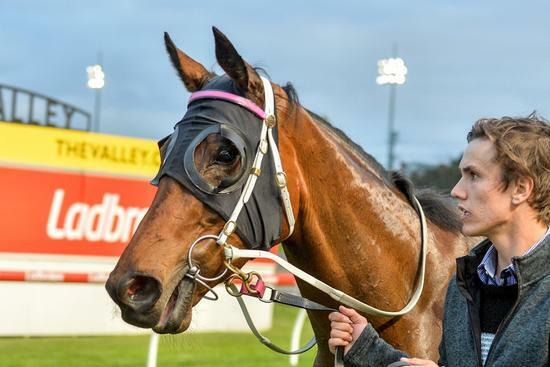 3 wins at 1400m, 1450m in Aust. Dibaba. 2 wins-1 at 2-at 1000m, 1050m, BTC Cleanevent Brisbane Bloodstock H.
Mr Solitary. 5 wins to 1400m, 3d BRC Racetree H.
Nobody's Boy. 5 wins to 1400m in Aust. Tickle Me Quick. 2 wins at 2000m, 2150m in Aust. Are You There. Winner at 1000m in Aust. Cincinnati Girl. Winner. See above. Diamond Kate. Placed in Aust. Race Record: 26 Starts 4-2-1 A$65,645. 4 wins from 1600m to 2100m to 2015-16 in Aust.